AS A NEW month begins we look back at another good month — a month in which courts generally continued to ‘reform’ or shall we say ‘tame’ the USPTO. There have been several rulings which due to lack of time we need to mention belatedly. Earlier this month a federal court in California held as patent-ineligible all 28 asserted claims in three separate patents in Maxell v. Fandango Media, based on its analysis of only one “representative” claim. This was via a Rule 12(c) motion for judgment on the pleadings. The court had already found, via a Rule 12(b)(6) motion to dismiss before any claim construction, another claim from another patent to be drawn to patent-ineligible subject matter. It is disconcerting to see courts take such a glib approach to invalidating claims in this way, and it strikes me that this case is a great vehicle to use to discuss the notion of a “representative” claim. Actually, it’s well overdue; the courts need to do something about patent maximalism and we’re very gratified to see the past few years’ developments. We hope for more of the same. It’s no secret that the USPTO granted far too many patents for a number of years if not decades. Patent Trial and Appeal Board (PTAB) inter partes reviews (IPRs), part of AIA, have helped improve that somewhat, albeit not sufficiently. Now that we’re past the ten millionth patent Patently-O reveals another incredibly stupid patents — a reminder that software patents are still being granted by the Office. “It is basically a computers system that gamifies your life — comparing your life score to those of your neighbors, co-workers, or others,” Patently-O wrote some days ago, adding the corresponding figures to demonstrate just how dumb this patent is. As we shall show further down, it does not seem as though the new leadership (new Director rather) is interested in tackling the issue; instead, it would rather exacerbate matters. Just over a week ago Kansas City Business Journal published “Lawsuit alleges company paid ag tech company $7M for ‘worthless’ patents” — a symptom of an office that would rather grant than properly examine applications. Applicants should live and learn. A lot of US patents are totally bogus (some bogus to the extreme) and in retrospect some companies are entitled for compensation. This can’t possibly inspire much confidence in the system. Likely all of these are bunk software patents. Do they care? Do they just aim to increase the total number rather than quality and validity? This linked to the latest (at the time) patent maximalist nonsense from Meredith Addy and it is titled “Alice at Age Four: Time to Grow Up” (implying or at least insinuating that patent justice is some kind of immaturity). We don’t want to rebut every single claim as that would take a lot of time and give more exposure to Watchtroll (those patent zealots would otherwise get little or no attention). “Grow up and face the fact software patents are unsuitable for purpose” was my response to them. It’s just another one of their anti-Alice rants and no new information (or news) is being offered to support the headline. Burman York (Bud) Mathis III, another anti-Alice person who contributes to Watchtroll occasionally, resumes the CAFC bashing (Federal Circuit smears). The EPO became notorious for attacking judges, the ITC ignores PTAB judges, and whenever the above people attack 35 U.S.C. § 101 rather than the U.S. Patent and Trademark Office (e.g. for granting software patents in spite of 35 U.S.C. § 101) they reinforce the view or perception that all they care about is money, not justice. We at Techrights care about innovation and justice; we recognise that many patents are unjustly being granted and this harms innovation, sometimes quite profoundly. “Patent rights are under attack,” Watchtroll wrote the following day, basically pointing out that Justices telling off and putting aside bogus patents is somehow an “attack”. Actually, the patent trolls and aggressors are the attackers. Who is being attacked here? And by who? How very classic a reversal of narratives. Are the people at Watchtroll even trying to be honest with themselves? It certainly doesn’t look like it. We should probably point out that nothing is about to change. Nothing at SCOTUS can revive software patents any time soon (or ever). The USPTO changing its guidelines won’t impact what courts are saying, as we explained a week ago. Dennis Crouch’s latest outline of SCOTUS cases is encouraging in the sense that he too is willing to reveal nothing in the face of Alice, which soon turns 4.5 years old. Such is the nature of patent maximalists however; we’ve been showing for years how they attacked PTAB and its judges, culminating in attacks on SCOTUS and CAFC earlier this year. If it keeps getting worse, sooner or later judges will get rather angry at these patent maximalists and rule against them just for spite. A lot can be said about Techrights and its attitude, but we never attack judges unless they engage in clear misconduct like Rader and Gilstrap do. Judges have a job to do and in a society saturated with judge-bashing blowhards civility goes down the drain. Plaintiff Guada Technologies, LLC (“Guada”) sued Defendant Vice Media, LLC (“Vice Media”), alleging infringement at least claim 1 of U.S. Patent No. 7,231,379 (“the ’379 patent”). Vice Media then filed a motion to dismiss. Last week, Judge Richard G. Andrews of the U.S. District Court for the District of Delaware ruled that the claims are directed to an abstract idea under 35 U.S.C. § 101, but that a factual issue remains as to whether the claims provide an inventive concept. The ’379 patent, entitled “Navigation in a hierarchical structured transaction processing system,” relates at a high level to navigating through a hierarchical network of “choices” (e.g., transactions, or operations where information is accessed) to accomplish a goal. In such a network, choices are arranged as nodes in a graph structure. As an illustrative example, Figure 3 of the ’379 patent is shown below, which is in the context of airline reservations. On September 13, 2018, the Federal Circuit affirmed three final written decisions of the U.S. Patent Trial and Appeal Board that held unpatentable various claims of U.S. Patent No. 6,091,940, owned by ParkerVision. The ’940 patent, entitled “Method and System for Frequency Up-Conversion,” relates to the frequency conversion of low-frequency baseband signals to higher-frequency (e.g., radio frequency or RF) signals. Qualcomm filed three petitions for inter partes review challenging the ’940 patent. The PTAB’s (and later the Federal Circuit’s) analysis split along whether the claims were apparatus or method claims. In other words, with respect to apparatus claims, the Federal Circuit stated that if a prior art reference discloses an apparatus that is reasonably capable of operating as claimed, that reference could anticipate or render obvious the claims at issue. Additionally, when considering method claims, a reference is properly asserted, under 35 U.S.C. §§ 102 & 103, when there is a clear motivation to combine the references and a demonstrated expectation of success by a skilled artisan. Judges O’Malley, Reyna, and Taranto have generally been ruling just fine. Crouch once resorted to an ugly personal attack on Judge Reyna, but what else can be expected from patent maximalists who can’t get their way? The Federal Circuit on Monday upheld a finding that parts of four robotics patents were invalid under the U.S. Supreme Court’s Alice test, preserving a victory for Invensys Systems Inc.
What’s really noteworthy here is the consistency in which CAFC rejects abstract patents, citing Alice. Back in 2016 CAFC did not always do this. Things changed for the better around 2017 when CAFC accepted just about zero software patents. We wrote about this several times last year. Alice really took a strong(er) foothold at CAFC after Judge Mayer had ruled against software patents in Intellectual Ventures v Symantec. Nothing has been the same since. We hope things will stay the same. So do groups like HTIA, CCIA and the EFF. If this patent was to be properly (re)assessed, it would almost certainly be invalidated. Such patents are dropping like flies these days. Examiners ought to stop granting these already. The certainty associated with US patents would otherwise suffer. He’s not interested in reforms. He views them as a mistake. He brought “swagger”? Really? It was a boon for patent trolls, that’s all it was. Litigation soared. The litigation ‘industry’ currently hope that Iancu will be another Kappos. This new article by McKee, Voorhees & Sease, P.L.C. is titled “Hope From The PTO Director” regarding “Patent Eligibility” as if the sole goal of a Director is to endlessly broaden patent scope. Forbes, we might add again, is giving a platform (even whole blogs!) to trolls and aggressors, brandishing patent propaganda every single day. Forbes is a rag of billionaires who make a living by attacking society, so trolls’ agenda seem compatible. Watch how patent troll David Pridham (Dominion Harbor) calls the Director of the patent ‘industry’ “New Sheriff Aims To Stop Patent Thievery” (that’s the headline). 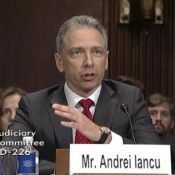 So Mr. Iancu found support… from patent trolls. That says quite a lot about him. This patent troll appears to be hiding behind yet another one of its many shells, having taken patents from Microsoft’s largest troll, Intellectual Ventures. In the recent case Intellectual Ventures I LLC v. T-Mobile USA, Inc., the Federal Circuit overturned a district court’s claim construction for reading in a limitation and upheld the district court’s invalidation for indefiniteness for including a subjective term. To show a disavowal, a defendant is often better served by focusing on the elements of the prior art rather than parsing the language of the patentee’s responses. (It’s not clear whether this strategy was available to T-Mobile here.) Heavy scrutiny of the language of the patentee’s counterarguments can often be outweighed by other intrinsic evidence. The prior art can support a more compelling story: the patentee shrank the scope of its claims because it hadto, in order to escape prior art disclosing the disavowed element. So the patent office kept ‘producing’ patents for patent trolls — only for these patents to repeatedly get thrown out by courts. If the patent office wants to move in a positive direction, it will restrict the rules and lower the number of grants. Sometimes less is more (like higher quality or more legal certainty). That’s just more of the same. Go ahead and bash the court/s. Carry on. You’ll just alienate judges. For merely applying the law, based on precedence and common sense, they receive abuse and scorn. All this ridicule is counterproductive and makes the atmosphere more toxic. Remember that Mr. Gross contributes to sites of patent trolls. He’s close to patent trolls. The patents in question are highly notorious and they’re likely to be squashed entirely some time in the future, preventing further extortion. The Federal Circuit has been releasing a substantial number of sealed opinions that stem out of confidential briefs. The Court’s usual operating procedure is to issue the opinion in a sealed form along with an order to show-cause as to what aspects of the opinion (if any) need to remain under seal. I’ll note here that the “rights” defined by Section 1835(b) appear purely procedural — the trade secret owner gets a chance to explain its position in an under-seal filing. It does not actually prevent the court from subsequently disclosing the alleged trade secret. AIA changed the rules and SCOTUS changed all sorts of things, including patent scope. So whatever happened beforehand may no longer be of relevance. That’s not a concept that’s difficult to grasp. Law changes over time. It can evolve or devolve (depending on different people’s perspectives). What worries us about the US is that Trump appointed a patent maximalist as Director. This Director seems not to respect courts and instead puts patent law firms first. He came from a patent law firm that had worked for Trump. Days ago we saw this press release about two new US patents, one of which on “Methods for Decryption as a Service,” i.e. a bunk software patent (maybe the other patent is also a software patent, but we haven’t checked). What good are these bogus patents from Bluefin? Why did examiners grant such patents? Here is another press release about bunk, invalid software patents. Nothing to brag about, certainly not in a press release. Why does the USPTO play along with this? Section 101 among other sections would likely come into conflict. If often seems as though the sole goal is to grant as many patents as possible, making the patent system almost impossible to navigate. Mind this other new press release. “Patent Management Software Market to Witness Comprehensive Growth by 2028,” according to Patent Management Software Market hoping to Witness Comprehensive Growth by 2028. No rebuttal necessary. Just the stupid headline. Pure marketing. They offer to help “manage” a pool of millions of patents, many of which of dubious validity. Over at Watchtroll, days ago Margaux Savee, Suni Sukduang and James Murphy said that the USPTO updated its trial practice guide. Maybe they should update it to warn that many of the patents it grants are of no use in trials. The latest nonsense from Watchtroll (yesterday) was titled “Intellectual Property Considerations and Guidance for Start-Ups: Patents” (link). Well, “Start-Ups” don’t need patents most of the time; they’re most threatened by patents, albeit misled on those by patent law firms (looking to just make more ‘sales’). With the future of flying vehicles for personal transportation coming into more focus, we wanted to explore filings at the U.S. Patent and Trademark Office to see the current state of flying car technologies, both in the patent grants being issued by the UPSTO as well as in the patent applications being filed at the agency. Will the patent office try to interject some excitement by granting patents on merely theoretical things? Even things like spacecrafts from science fiction movies? Taking stock of much of the above, it’s sometimes depressing to see the patent office (especially its management) — unlike courts — falling into the very hands of those whom officials are supposed to govern/control. Iancu was never the right person for the job. The Federal Circuit recently reversed a Patent Trial and Appeal Board (“Board”) inter partes review decision on nonobviousness, holding that the Board erred when it did not require Synvina, the patent owner, to come forward with evidence of nonobviousness (e.g., teaching away) once DuPont, the petitioner, established the prior art disclosed an overlapping range for a claimed result-effective variable. See E.I. du Pont de Nemours & Co. v. Synvina C.V., No. 2017-1977, 2018 U.S. App. LEXIS 26194 (Fed. Cir. Sept. 17, 2018) (Before Lourie, O’Malley, and Chen, J.) (Opinion for the court, Lourie, J.). The Federal Circuit affirmed the PTAB’s final decision following inter partes review that claims 1-5 and 19 of the ’977 patent were unpatentable as anticipated (Nobel Biocare Services AG v. Instradent USA, Inc., September 13, 2018, Lourie, A.). On petition, the original panel has revised its opinion — but maintained its judgment vacating the damage award. So nothing really changed. Generally speaking, nothing works in favour of software patents proponents and patent maximalists these days; except perhaps some public speeches by Iancu (albeit he’s not a judge or a lawmaker). This billionaire gets no respect! Gilbert Hyatt is the named invenetor [sic] on 70+ US patents and has 400+ pending patent applications “all of which were filed prior to June 8, 1995.” That date is critical because those “pre-GATT” applications will remain in force for 17-years from their issue date (if they ever issue). These applications claim priority back to the early 1970s. For the past 10 years, Hyatt has been trying to get his cases heard by the PTAB – but has been repeatedly foiled by PTO delays and unilateral reopening of prosecution. Here, the Federal Circuit sided with the PTO in Hyatt’s generalized challenge to this practice — finding portions of his his petition time-barred and that the substance of his challenge lacked merit.